by Jarrod Jones. Hard rain pummels brick and pavement, a cacophonous deluge that beats down upon the righteous and the sinner alike. There’s a killer stalking the city tonight. And a broken cop to meet him. It’s a gritty cop saga, rife with tension and packed with heart. A hard-assed comic with soft inspirations, brimming with a surprising amount of depth and psychological drama. Nerve-wracking thrills that owes just as much to Bill Watterson as it does to Frank Miller. 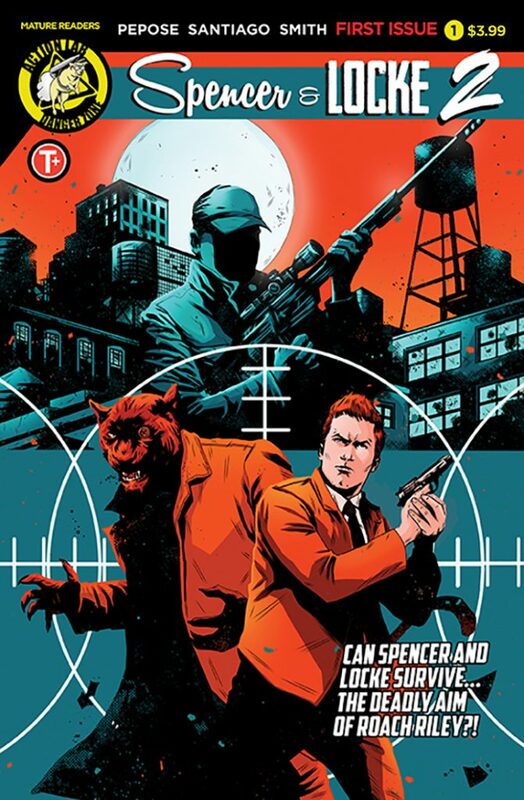 That’s right: Spencer & Locke is back, and it has its best stuffed panther buddy in tow. 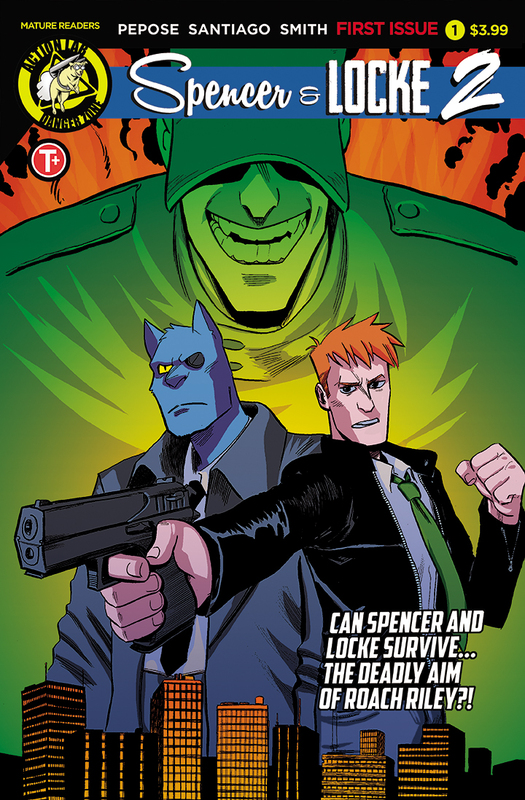 Spencer & Locke 2 reunites Jorge Santiago, Jr., Jasen Smith and Colin Bell with writer David Pepose, a five-time ‘Ringo Award nominated team given carte blanche by Action Lab Entertainment to further the adventures of this fan-favorite detective team. They’ve tapped into a poisoned vein for this sequel series, the one that imbues most second outings with dread and foreboding. And they’ve conjured a sinister foil to stalk Detective Locke and his not-so fluffy pal—the heinous Roach Riley, who shares similar origins to Spencer and Locke, but could have only come from David Pepose’s mind. When a book is this good, there’s no need to argue. Watterson and Walker collide with Miller and Brubaker in this, the exhilarating second chapter to a critically-acclaimed series. 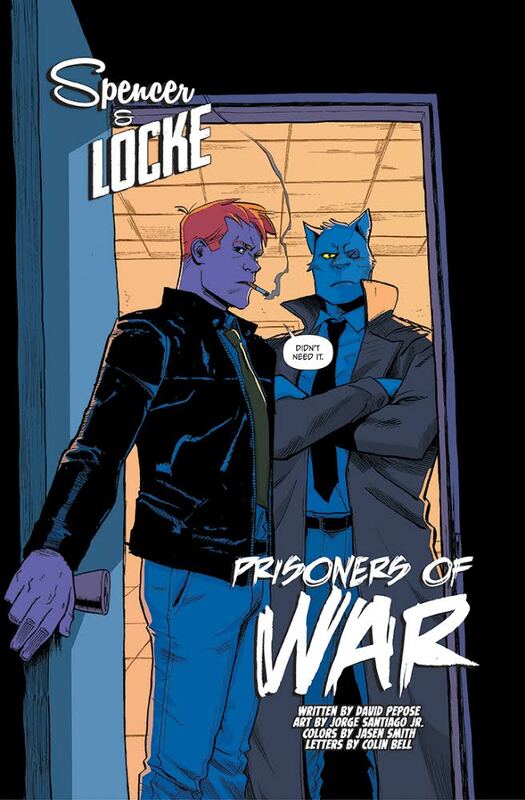 As April 2019 solicitations hit, David Pepose spoke with DoomRocket about Spencer & Locke 2, the darker nature of sequels, and how good it feels to get the band back together. DoomRocket: When last we spoke, you said, “If readers decide there is a market for our first arc, I have at least two more story arcs in mind for ‘Spencer & Locke’.” One year later, and here we are talking about ‘Spencer & Locke 2’. Did you suspect your story would come this far? David Pepose: You know, I was hopeful! [Laughs] The thing is, as soon as I saw Jorge Santiago, Jr. and Jasen Smith’s pitch pages first come in, I knew Spencer & Locke was going to be something potentially polarizing but undeniably special—even if people didn’t respond to the story I had written, I could see the artwork was just objectively beautiful. I was working with a dream team! But thankfully, people really seemed to click with the substance of our first arc, and it was particularly heartening that readers resonated with what I felt was the most important part of our series: not just our twisted nods to classic newspaper strips, but watching Locke grapple with his traumatic past, and yet still find reasons to keep on living. There’s a darkness to Locke’s trajectory, but I think it’s that lining of hope and redemption—particularly his friendship with his imaginary talking panther, Spencer—that makes him such an inspiring character for me. We all have scars—the question is, what do we do with them? 2. Tell our readers where Detective Locke and Spencer, his imaginary panther partner, are at in the beginning of ‘Spencer & Locke 2’. DP: In our last arc, Spencer and Locke survived deadly shootouts, harrowing car chases, and a criminal syndicate led by someone deep at the heart of Locke’s harrowing upbringing—but in Spencer & Locke 2, they’re learning that no good deed goes unpunished. They might have saved the day, but now our heroes are suspended by Internal Affairs—which not only jeopardizes Locke’s career, but also having custody of his young daughter, Hero. We had a lot of fans ask us how someone like Locke—who is literally hallucinating his best friend—would pass a psychological evaluation to become a cop, and it was always part of the plan to address those questions here. Nothing happens in a vacuum—you can’t fight crime the way Spencer and Locke do without facing consequences. Which leaves our heroes already on the ropes by the time Roach Riley starts cutting a bloody swath through the city’s political elite. 3. 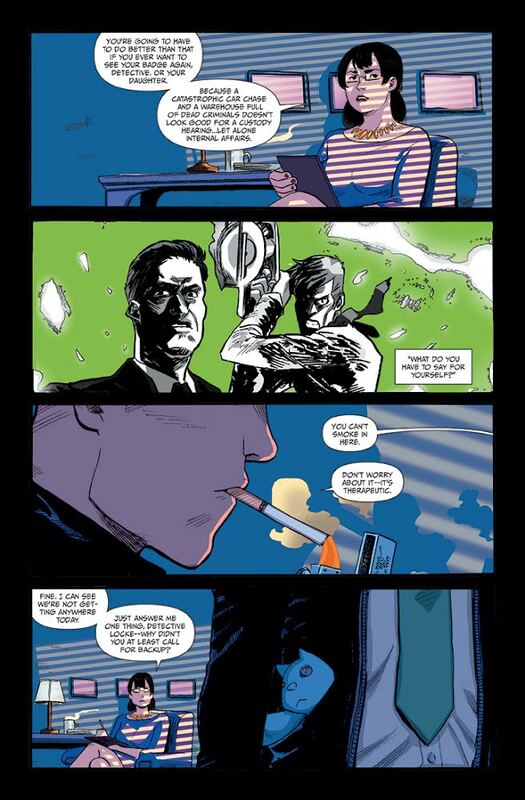 Reading through ‘Spencer & Locke 2’, I noticed that you and artist Jorge Santiago have embedded a clever echo to the debut issue of the original arc: the initial three pages are nearly identical. Page one in both issues contain a flashback sequence that employs the art style of a classic cartoonist (in this arc’s case, it’s ‘Beetle Bailey’ creator Mort Walker) while zeroing in on a traumatic moment for a major character. Then the following double-page spreads show us these characters as they are today, with all the trauma they carry with them. No captions, just sequentials. Was this your way of showing how the new heavy of ‘S&L 2’, Roach Riley, might be the ultimate foil for Detective Locke? DP: First off, thank you for noticing that! You’re absolutely right—we started off the original Spencer & Locke with this sort of stark juxtaposition of styles, and we wanted to really reinforce that in so many ways, Roach and Locke are cut from the exact same cloth. They’re both the products of almost unimaginable suffering—but in the case of Roach, we actually flipped the layout of our opening double-page splash, to show readers that he’s the dark side of pain and trauma, sort of beyond the looking glass of Locke’s worst nightmares. 4. So, Roach Riley. His coming seems to signal that ‘Spencer & Locke’ is going down darker, more complex roads. Is that merely an inevitability of the sequel series? That things must become more dire? DP: What was that line in The Dark Knight? “It’s always darkest before the dawn?” Or maybe it’s always darkest… before things turn completely black. [Laughs] I’ll never tell! The thing is, with Spencer & Locke 2, we were looking at that inevitable escalation, now that we’ve thoroughly established our main characters—and so we took a lot of cues from sequels like The Dark Knight, The Empire Strikes Back, and The Godfather: Part II, putting our characters into more dangerous sorts of situations that wind up cutting deep in their personal lives as well. But I think you hit the nail on the head as far as complexity goes—because ultimately, that complexity is what keeps a book like Spencer & Locke from wearing out its welcome. This is a world that has to evolve or die—but I think it was baked into the original high concept that if we took a dark spin on Bill Watterson’s Calvin and Hobbes, why not do the same across the rest of the funny pages? They all lived on the same page when I was reading the comics section of the newspaper as a kid—so why not replicate that effect by putting all these wildly diverse characters in the same twisted world? So I think of it as a remix just as much as a sequel. 5. Did you always know that Mort Walker’s strip was going to be the catalyst for this new character? 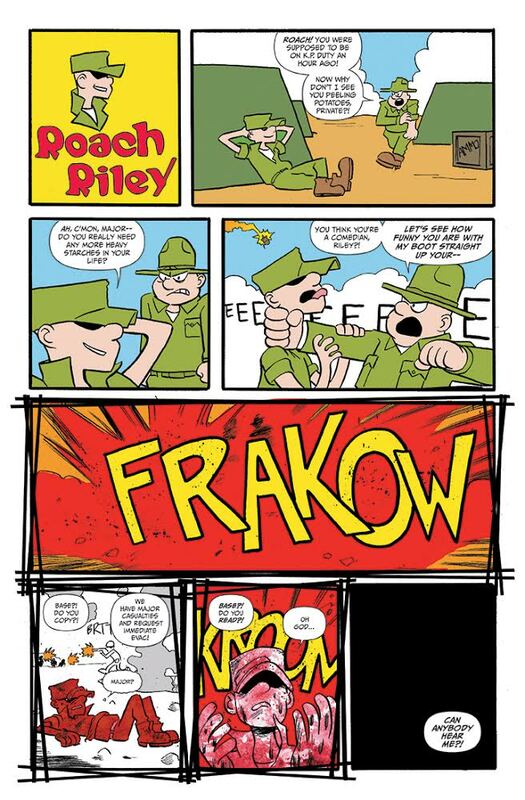 What was it about the ‘Beetle Bailey’ strip that you felt would compliment your series’ “‘Calvin & Hobbes’ meets ‘Sin City'” aesthetic, and the themes that come with it? Why this instead of, say, a complex, grim, frightening version of Jon Arbuckle? DP: Yep, Roach was actually the plan going back even before I approached Jorge to draw the book—there’s something just unexpected, creepy and even a little morbidly funny about taking Mort Walker’s slacker Army private and turning him into just an unstoppable killing machine. Because when you think about the sorts of threats that policemen face, the idea of street-level crime feels almost ubiquitous—but the idea of dealing with large-scale terrorism, well, that’s the sort of threat that feels overwhelming and unthinkable. So why not put our heroes into really hot water, and give this unstoppable terror a face? 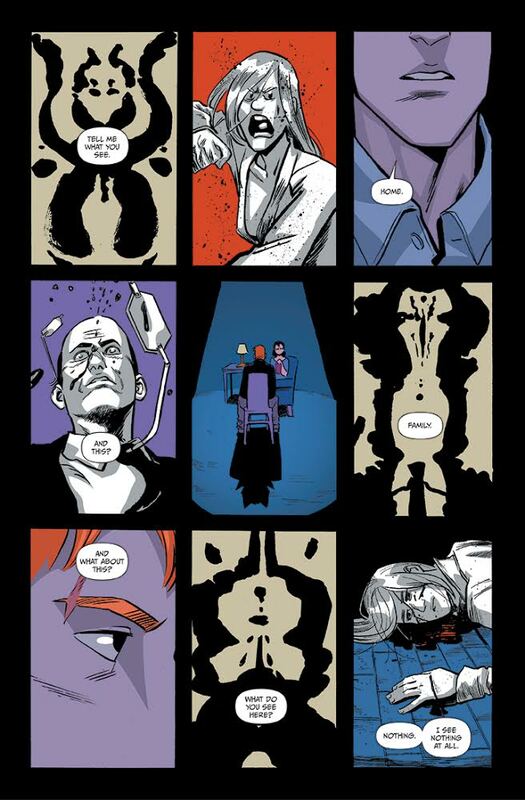 But even with that idea in place, it still took me a little while to really zero in on the themes that Roach represented, to make sure that he had his own unique personality and point of view, the same way that Spencer and Locke both did. I’m really proud of what we came up with, however—honestly, Roach has been my favorite character to write this entire arc, and given how much I love Locke as a character, that’s saying something. 6. Looking at ‘Beetle Bailey’ after reading ‘S&L 2’ #1 gave me the willies. There’s something… more to Roach Riley, that much is clear by the end of this issue. He’s angry, he has an agenda, and it’s clear he’s enjoying himself when he carries his missions out. How will you be applying the series’ themes of trauma to the character of Riley when he seems to be enjoying the evil he brings to this world? DP: When I first discussed Roach to Jorge, I described him as less of a Terminator-style, inhuman killing machine, and more like an artist, or really an apostle—granted, an apostle of pain and suffering, but an apostle nonetheless. Roach saw something while he was overseas, and while we might think that experience scarred him irrevocably, Roach might argue that he had the scales lifted from his eyes. He has a very twisted philosophy regarding pain and suffering, and he’s looking to spread the good word with as much violence as possible. Unlike Locke, Roach has found a sense of humor as he goes about his mission—he does enjoy his work, in part because he’s just so damn good at it. 7. Let’s talk about Detective Locke and his greatest pal. It’s clear that, following the events of ‘Spencer & Locke’, there’s a gap that’s widening further between the two. How is this going to affect Locke’s ability to function—especially now that it’s becoming clear that his own instability is affecting Spencer’s ferociousness? DP: I’ve always considered Locke to be a high-functioning schizophrenic, essentially holding onto sanity by the fingernails—but given the fallout he’s dealing with from our last arc, not to mention his back against the wall thanks to Roach’s rampage, we might see those fingernails start to slip a little bit. And given that he’s a figment of Locke’s tortured psyche, it’s not surprising that Spencer is starting to get a little more savage, as well. We’ve found some new ways to push and test the boys’ dynamic in this sequel, but in the face of this overwhelming threat, Spencer and Locke’s growing differences are either going to make or break their partnership. 8. And what about Locke’s own growing surrogate family? He’s currently seeing Melinda Mercury, star reporter, and he’s fighting for custody of Hope Jenkins, the young girl who entered his life by the end of ‘Spencer & Locke’. How will Locke’s current wreckage of a life begin to affect these people? DP: It’s funny, because seeing Locke on the outside—and knowing his symbiotic relationship with Spencer—you’d think he’d be just a total train wreck, right? But you’re right, Locke has still managed to bring people into his orbit, perhaps by the sheer gravity of his own sadness. As far as Melinda Mercury goes, she and Locke’s relationship is… ill-advised at best, given that he’s a cop and that she’s an investigative reporter. But the thing they have in common is that they’re both drawn to damaged people, and that they both share a detective’s intuition—which is going to be crucial to figuring out the secrets behind Roach’s killing spree. Hero, meanwhile, is one of my favorite characters in the entire series—she’s everything that Locke’s not, but she’s also very much her father’s daughter, and that’s a divide she’s going to have to navigate in our second arc. 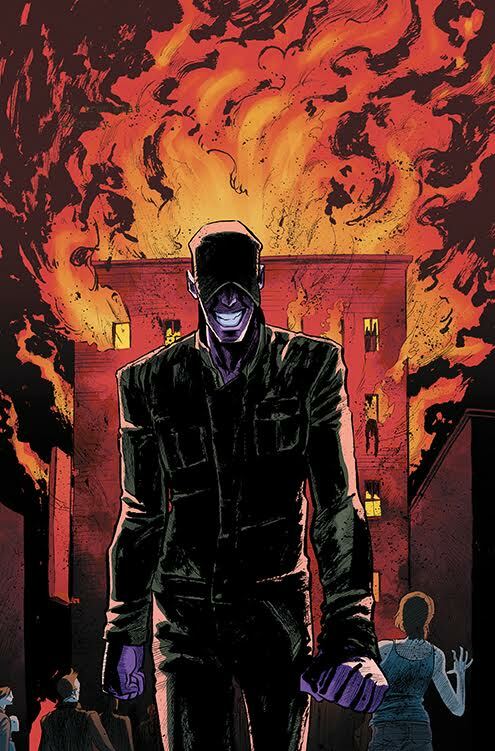 I won’t lie, I was really surprised with how many people loved Hero in the original series, and without giving too much away, those fans are going to be very, very happy with Hero’s journey in Spencer & Locke 2. 9. 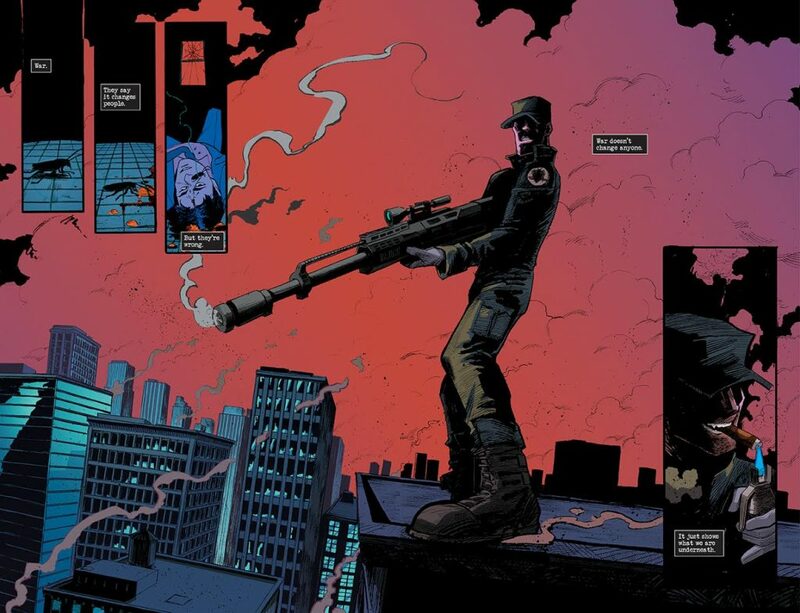 With ‘Spencer & Locke 2’, you’ve have the band back together: Jorge Santiago, Jr., colorist Jasen Smith, and letterer Colin Bell. How does it feel to have the opportunity to continue telling such a great story with this team? DP: It was really important to me to get the band back together with Spencer & Locke 2—it was one of the highlights of my professional career for all four of us to be nominated in last year’s Ringo Awards, because I know that when the chips are down, these guys will always deliver work that makes us punch way out of our weight class—and that also extends to our variant cover artists Maan House and Joe Mulvey, who are also swinging for the fences! But the best part about working with Jorge, Jasen and Colin again is that after four issues in the trenches together, we all know each other’s styles so much better—and real talk, I think we’ve all inspired each other to up our games with this second arc. Like you said before, there’s a level of complexity that I think we’ve each been able to hit stylistically as well as thematically, and that just comes with having the same team back together again. 10. I’d consider the image of Detective Locke and Spencer an iconic one, and I’ve said before that the potential for this series is limitless. Can you see yourself writing these stories for years, perhaps even decades, to come? DP: The biggest thing I’ve tried to take into consideration with Spencer & Locke is making sure we never overstay our welcome—we’re standing on the shoulders of artistic and literary giants by drawing from Bill Watterson, Frank Miller and now Mort Walker so deeply, but for the sake of our own artistic integrity, I only want to keep telling stories with these characters as long as we’re able to find something new to say with them. And, God willing, that there’s enough interest to keep going—I want all our fans to preorder Spencer & Locke 2, both because I think it’s an awesome story, but also to make sure we can even get a Volume 3! But real talk, having these tragic but inspiring characters in my head has been the highlight of my career, and the plans we have in store for them is going to be a real roller coaster for readers. If you thought our first arc was big for Spencer and Locke… well, you ain’t seen nothing yet. ‘Spencer & Locke 2’ #1 hits stores April 24. You can pre-order through your LCS (using the Diamond Code FEB191309) now. Get hyped on ‘Spencer & Locke 2’ with this exciting trailer, courtesy of Action Lab Entertainment! 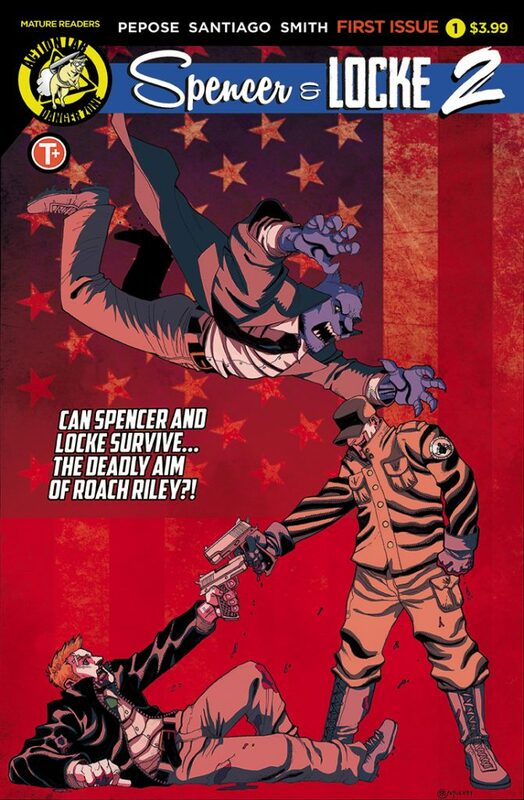 Check out this 6-page preview of ‘Spencer & Locke 2’ #1, courtesy of Action Lab Entertainment!